Van Jetes Hanshaw6 [Van Jetties Hanshaw7]. Born Apr 18 18902,3,5,6,7,8,9,10,11,12 [Sep 18 189013], Wallback, Clay County, West Virginia2,3,5,6,7,8,9,10,11,12. Note that Rhoda was the sister of Susan Vera Rogers who married Van's brother Grover. 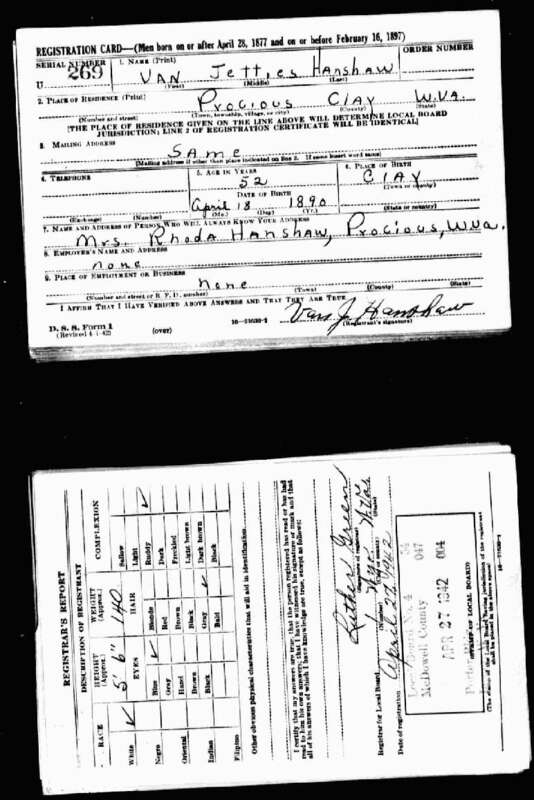 Hanshaw, Van, head-of-household, age 29, born in Clay County, West Virginia; father born in Clay County, West Virginia; mother born in Nicholas County, West Virginia; owned home (mortgaged); occupation: farmer, F.A..
Hanshaw, Rhoda, wife, age 2? [unclear], born in West Virginia; father born in Clay County, West Virginia; mother born in Roane County, West Virginia. Hanshaw, H. Guy, son, age 8, born in West Virginia; parents born in West Virginia; attended school. Hanshaw, Dora, daughter, age 7, born in West Virginia; parents born in West Virginia; attended school. Hanshaw, Kenney, son, age 5, born in West Virginia; parents born in West Virginia. Hanshaw, Amelda, daughter, age 4, born in West Virginia; parents born in West Virginia. Hanshaw, Cora, daughter, age 1 year 9 months, born in West Virginia; parents born in West Virginia. 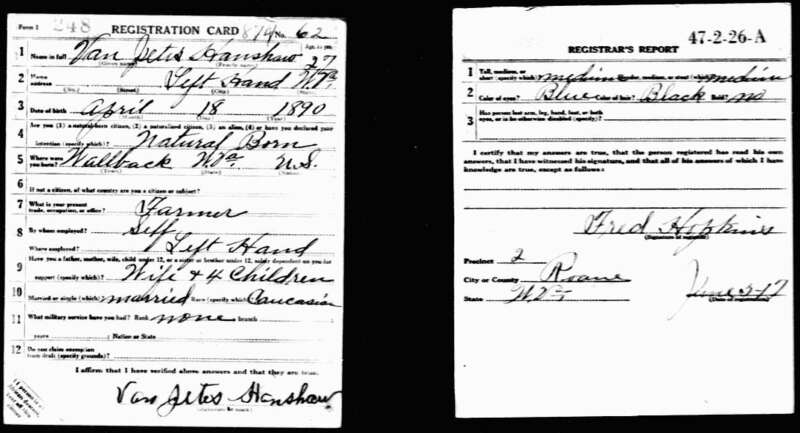 Hanshaw, Van J., head-of-household, age 40, born in West Virginia; parents born in West Virginia; first married at age 20; rented home; no radio in home; occupation: watchman, [..unclear..]; not a veteran. Hanshaw, Rhoda, wife, age 39, born in West Virginia; parents born in West Virginia; first married at age 19. Hanshaw, Guy H., son, age 18, born in West Virginia; parents born in West Virginia; attended school. Hanshaw, Dora G., daughter, age 17, born in West Virginia; parents born in West Virginia; attended school. Hanshaw, Kinnie C., son, age 15, born in West Virginia; parents born in West Virginia; attended school. Hanshaw, Almenda H., daughter, age 13, born in West Virginia; parents born in West Virginia; attended school. Hanshaw, Cora M., daughter, age 11, born in West Virginia; parents born in West Virginia; attended school. Hanshaw, Carl J., son, age 8, born in West Virginia; parents born in West Virginia; attended school. Hanshaw, Clyde N., son, age 6, born in West Virginia; parents born in West Virginia; attended school. Hanshaw, Van J. Jr., son, age 3, born in West Virginia; parents born in West Virginia. Hanshaw, Mable C., daughter, age 1, born in West Virginia; parents born in West Virginia. Hanshaw, Van J, head-of-household, age 50, born in West Virginia; completed 7th grade; on Apr 1 1935 was living in the same place/area; owned farm ($300 value); occupation: farmer. 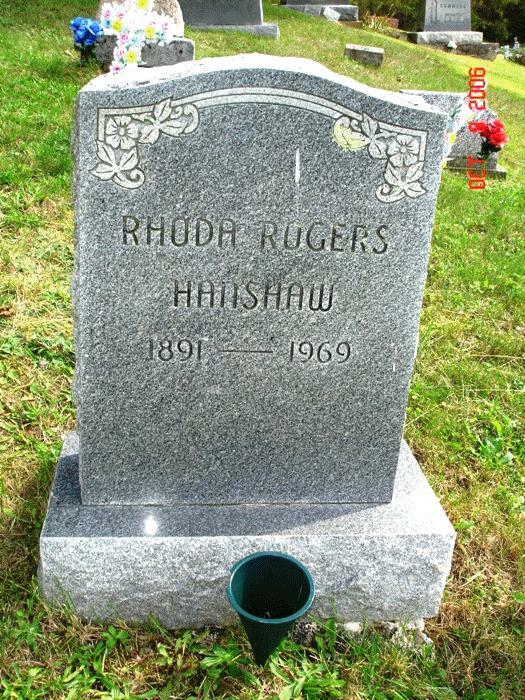 Hanshaw, Rhoda, wife, age 49, born in West Virginia; completed 7th grade; on Apr 1 1935 was living in the same place/area. Hanshaw, Amelda A, daughter, age 24, born in West Virginia; completed 2 years of high school; on Apr 1 1935 was living in the same place/area. Hanshaw, Clyde, son, age 16, born in West Virginia; completed 8th grade; on Apr 1 1935 was living in the same place/area; occupation: farmer. 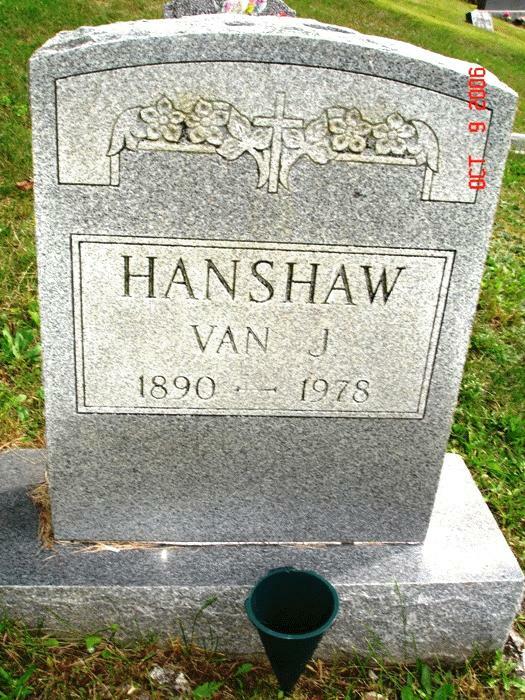 Hanshaw, Van Jettes Jr, son, age 14, born in West Virginia; completed 7th grade; on Apr 1 1935 was living in the same place/area. Hanshaw, Mable C., daughter, age 11, born in West Virginia; completed 2nd grade; on Apr 1 1935 was living in the same place/area; attended school. Hanshaw, Maxine M, daughter, age 9, born in West Virginia; completed 4th grade; on Apr 1 1935 was living in the same place/area; attended school. Hanshaw, Lenora J, daughter, age 7, born in West Virginia; completed 2nd grade; on Apr 1 1935 was living in the same place/area; attended school. 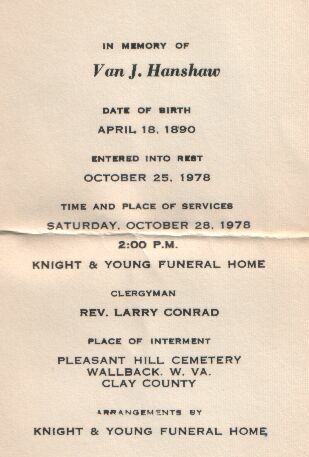 Van J. Hanshaw funeral card; courtesy of (). Obituary of Corn Wallace Hanshaw.